The Ancient Egyptians believed that elements of the soul were perishable and therefore at great risk. The tomb, the process of mummification, rituals and magic spells promoted the well-being, and ensured the preservation of the dead and their Ka, Ba and Ahku. But what exactly was mummification? Mummification Definition: Mummification was the process of preserving and embalming a dead body in the belief that the body would be necessary in the Ancient Egyptian afterlife. Using a special process the Ancient Egyptians removed all moisture from the body, leaving only a dried form that would not easily decay. The process of Mummification requires inhibiting microbial growth and dehydration. The process of creating a mummy was complicated and costly and was surrounded with ceremony and ritual. 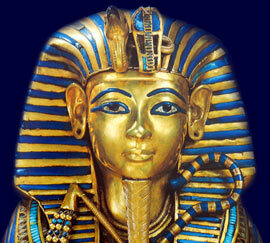 The tradition and history of Mummification started with the myths and legends of the Ancient Egyptian gods. In the mythical history Osiris was murdered by his younger, jealous brother Seth but brought back to life (resurrected) by Isis for just one day, when their son Horus, was conceived. The body of Osiris was embalmed by Anubis who therefore made Osiris the first mummy. The Egyptian method of preparing the body varied over time and also with the social status of the deceased. At first only the pharaohs were mummified but this was later extended to other Egyptians who were wealthy enough to pay for the process. Eventually even the peasants were mummified. The Ancient Egyptians believed that every person was thought to have three souls - the Ka, the Ba and the Akh. The Ba was able to leave the tomb and revisit the dead person's haunts in the mortal world. The entities of the Ka, Ba and Ahk, or elements of the soul, were believed to be perishable and therefore at great risk. The tomb, the process of mummification, rituals and magic spells promoted the well-being, and ensured the preservation, of the dead and their Ka, Ba and Ahk. The purpose of mummification was therefore conducted to keep the soul alive and ensure a clear path to the Afterlife. The Egyptian embalmers were very secretive about the art and process of mummification and left no documents or accounts which related to their mysteries and rituals. Wall hieroglyphs and spells provide an insight into mummification, as do artefacts such as embalmers tools and the embalmers table. The writings of the Greek Herodotus have provided a significant amount of information on the process. Modern knowledge of the process has been obtained from the study of mummies.